Chelsea fans can finally look forward to UEFA Champions League football after failing to qualify for the prestigious tournament. Of course, some fans have slumped to the conduciveness of being content in watching the other EPL sides play midweek whilst they reminisce on what it used to be like. The 3-0 spanking of Leicester City saw us climb the EPL table. Forget the League position, let’s talk performance. There was bound to be a response from the humiliation at the ends of our Capital neighbours Arsenal, and Antonio Conte has shown that he has successfully rallied his side back to their best. 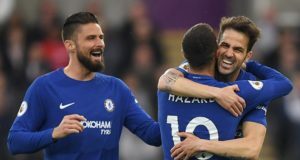 With this kind of performance, the odds of Chelsea winning the League could take a steep dip if they continue to churn out results. The Chelsea side that lost at the Emirates stadium was left demoralised. It could never be worse than that. But Conte has managed to rally his boys back to superb form. Now, we have kept 2 consecutive clean sheets since the Gunners’ game, with five goals scored against Hull City and Leicester. Whilst the Hull could be regarded as minnows since they are largely inconsistent in the League, the League champions, Leicester, are a real test; worthy enough to show if we are fully prepared for the top four this season. We never thought it that Conte would have us eyeing Champions League football quite soon, but look what we have here now! He is justifying the board’s decision to sack Mourinho. So Sweet. Mourinho is taking United to the new lows, near what the United fans are used to seeing in recent years since the retirement of Alex Ferguson. To make matters worse, his star-studded team are not looking like they would gel anytime soon, perhaps next season. A stark opposite of the United side are the Blues who are on the rise, just one point behind fourth-placed Liverpool, and three points adrift of League leaders Manchester City. Don’t be carried away though, our next fixtures are somewhat tough, with the likes of Manchester United, West Ham and Southampton all in quick successions. At the other side of the Middlesbrough games will see us play Manchester City and Tottenham, which are tough fixtures if you ask me. However, this Chelsea side have shown that they have the mental strength to answer whatever the opponents would pose. It is a good thing that Costa and Eden Hazard are in top form now, so that gives us the edge when going forward. It is a tad too earlier to judge this side but keeping our eyes on European football is not too much of an as king.